All right stop. Collaborate and listen, I’m back with my brand new invention. 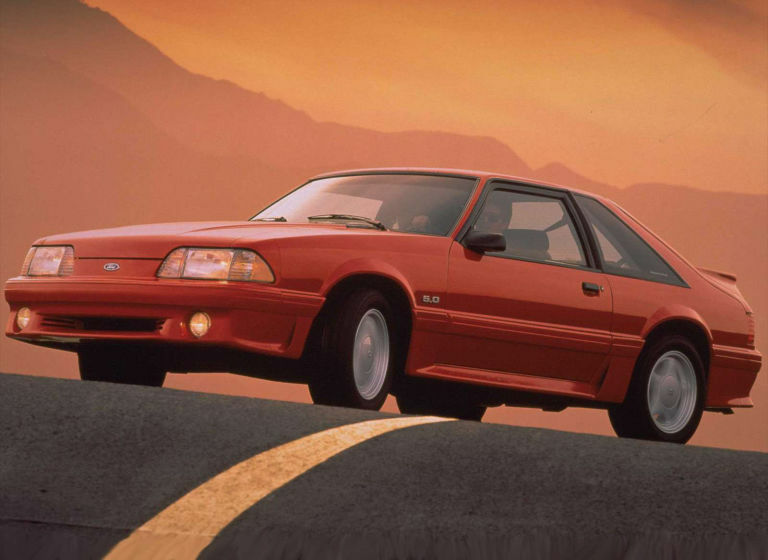 Something that’s grabbing a hold of the market tightly: the Fox-body Mustang 5.0. Ridiculous? Nope. It’s true: Long after Vanilla Ice “borrowed” a bass line and bragged about rollin’ in his Five Point Oh, and even after Queen and Bowie were awarded royalties as a result of this simple oversight, the cars Mr. Van Winkle so enthusiastically rapped about back in 1990 are seeing a huge resurgence in popularity. And now’s the time to get yourself one. Those of us of a certain age grew up in a bleak time for performance cars. It began with the death of the muscle car era in 1972. Gone were the days of 400-plus horsepower available from the showroom floor, and in their place were wheezing, castrated machines festooned with velour interiors, 8-track players, suspensions made of goo, and 180 hp to drag it all around, at best. Wide-open throttle in a 1981 Corvette, ostensibly America’s premier performance car of the time, hurled the car ahead with the ferocity of an asthmatic at a track meet and a sound only matched by a Hoover upright. Or the asthmatic. It wasn’t any better in the pony-car segment, either. The last glimmer of hope had been a Pontiac Trans-Am with a real Pontiac 400 CID V8 and a 4 speed, but that ended in 1980 when the best engine available was the turbocharged 301 CID version of Pontiac’s V8. It had a light on the hood to let you know it was making boost because you sure couldn’t tell otherwise, and neither could the cars passing you. And then, in 1982, after 13 years, Ford hit us with the return of the Mustang GT, as well as the return of the 302, err, now “5.0L” engine. The headline on the ad announcing the GT changed my life: “The Boss is Back.” Sure, its new 5.0-liter “High Output” engine only made 157 hp, but combined with its 240 lb-ft of torque, that was enough to, per the ad, “consistently blow the new Z/28 Camaro into the shadows.” The gloves were officially off in Detroit—the horsepower wars were back, and Ford had thrown the first punch. The 1964 Pontiac GTO ignited the original muscle car movement, and the Mustang GT had just created a second coming, which thankfully is still going strong today. More important than the 5.0L’s swagger or chiseled good looks, however, was its sound and athletic nature. By todays standards it is a slug, but in 1982 it was a torquey, throaty, lightweight car that out-handled almost everything and introduced a whole new generation of people to performance pony cars. In the years that followed, the 5.0L Mustangs continually improved, getting faster every year and pushing the competition to do the same. And while many might argue the fact, I say the Mustang had more pluck than the others. More focus. I wasn’t alone in lusting after a 5.0L. Like many, I studied every change in every model year. Read every road test. Collected every showroom brochure I could from the local Ford dealership. Even volunteered to wash new Mustangs for free when a truckload would come in. Most memorable of the bunch was the 1984 G.T. 350 edition, which offered no more performance, but, G.T. 350! As time went on and the 5.0L Mustangs only got better and faster, the aspirational aspect of it all only grew stronger every year. These weren’t exotic cars; they were fast, affordable cars that any kid with a job felt was an attainable goal. And for many it was. Fast-forward to today and not much has changed. A generational shift in car collecting is afoot. Gen X’ers are chasing cars from the 70s, 80s, and even the early 90s. Leading the charge? Yep. Fox-body 5.0L Mustangs. Shocked? You shouldn’t be. These poster cars of our youth are currently available in fantastic condition, and in many cases for less than $20k. Which makes them less expensive than the most boring car you can buy new today. Okay, so any new car is safer, more economical, and easier to live with. But none of them are more entertaining or more effective at erasing years off your psyche every time you twist the key. Value added: You can actually be the cool guy you always wanted to be while using a 5.0 as your daily driver. Just another benefit of newer collector cars. Sold yet? If so, then the big question is which car to buy. The easiest place to start is the “four-eye” (1982 to 1986) cars vs. the “two-eye” composite aero headlight (1987 to 1993) cars. The four-eye cars saw a quick evolution from the 157-hp 1982 car, through the roller-camshaft-yet-still-carbureted 210-hp 1985 version, to the introduction of the EFI H.O. motor for 1986. 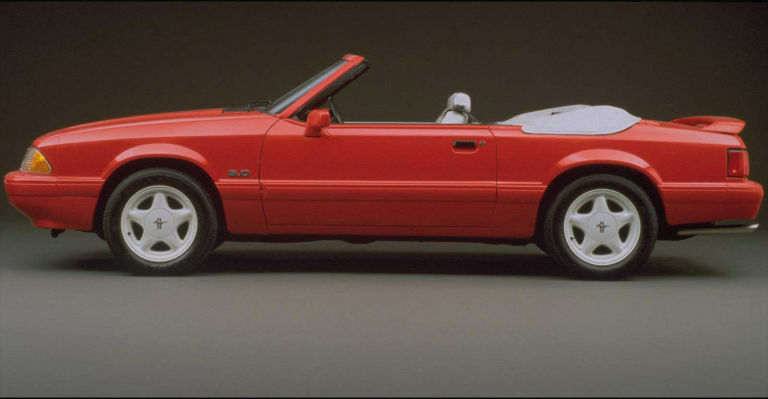 The face-lifted 1987 also brought a horsepower bump to 225 and, more importantly, 300 lb-ft of torque, which was the key to the Mustang’s performance. Also worth considering are the multitude of factory special editions. Some offered no performance benefit whatsoever (the aforementioned 1984 G.T. 350 for example, and the 1990 “7-Up” edition as another) while the limited production 1993 SVT Cobras and very limited production 1993 Cobra R are the top of the food chain for Ford-built cars. WHICH BRINGS US TO MY PICK: 1984 TO 1993 SALEEN MUSTANGS. Which brings us to my pick: 1984 to 1993 Saleen Mustangs. Steve Saleen, just like Carroll Shelby, was a professional racer that turned manufacturer. And his championship-winning race team stocked with Saleen Mustangs lends the racing heritage that is always a value-adding component. Plus, like any small manufacturer, Saleen Mustangs were built in minuscule numbers, making any of them rare. Every one was serialized and can also be documented through Saleen today, whic lends them another similarity to Shelby Mustangs. But all of this would mean nothing if the Fox-body Saleen Mustangs were all smoke and mirrors. Rest assured they are not. With a significantly improved suspension, brakes, and upgraded interior trim and exterior styling, they are indeed the 1965/1966 GT350s of the 1980s. And just like those Shelbys that were quite inexpensive even in the 1990s, the Saleen prices of today will seem ridiculously cheap in the next 10 years. No matter what version you pick, the good news is that many 5.0L Mustangs have been preserved. Of course, many more have been destroyed or modified beyond recognition, and those are cars I recommend avoiding. The value delta between a worn out or modified car and one that is still bone stock and “in the wrapper” would hardly cover a proper paint job let alone any restorative efforts. Other recommendations include opting for a 5-speed car if you’re down with the three-pedal deal, and avoiding some of the now-dated colors Ford offered later in the production run. What colors? Anything that would match Cyndi Lauper’s eye shadow when the car was new. Mechanically, any 5.0L car is robust, especially the 1987 and on cars. The engines are virtually indestructible, and while the same can’t be said for the Borg Warner T-5 manual transmission if abused, they are cheap to repair or swap out. The reproduction and replacement parts market is comprehensive and growing every day. Virtually every trim and hard part for a Fox Body car is available one way or another, and at very reasonable prices. Of course, a robust drivetrain doesn’t mean everything else is up to the same level. Rust is always a concern, as are all of the other standard used-car caveats, such as accident damage and deferred maintenance issues. And 1980’s Ford interiors are no different than any car of the time—miles of hard, now brittle, plastic and cheap materials that don’t wear well. Other considerations: The side skirt and body kit treatment given to the 1987 to 1993 GTs has fallen out of fashion for many, leaving the 5.0L LX version the collector’s choice in those years. And, Vanilla Ice aside, it also seems most people prefer the Hatchback body style to the Notchback or Convertible versions. I guess not everybody wants that ragtop down so their hair can blow. Or, maybe it is the fact that many of us don’t have much hair left? As for pricing, this is the one area that is time sensitive. Much like early Mustangs did in the 1980s, the 5.0L Fox Body cars are increasing in value rapidly—at least 10 percent a year from what I’ve seen. And the really special versions, such as Cobra Rs and Saleens, are exceeding that by a large margin. Examples: a showroom-quality, low-mileage 1988 LX 5.0L 5-speed will trade around $15k. A similar quality 1988 Saleen Mustang is $25k. And a 1993 Cobra R? Figure $65k. So there you have it, proof that, unlike stonewashed jeans or Duran Duran, some 1980s phenomenons are back and stronger than ever. Happy Fox Hunting. Colin Comer, our resident Mustang Guy, still rolls a 5.0 but no longer wears stonewashed jeans. Or so he says.